The map of Jersey below shows the location of 5 star, 4 star, 3 star, 2 star Jersey hotels. Click on the markers to view the hotel details. 2 Star, 3 Star, 4 star and 5 Star hotels in Jersey are listed below in alphabetical order. 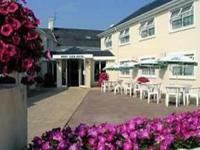 Wheatlands is a small and friendly hotel situated in the heart of the countryside in St Peter, Jersey. Offering traditional hospitality in a relaxing atmosphere, Wheatlands is the perfect hotel to get away from it all. Westhill Country Hotel is a family-run hotel in an elevated position within 5 acre of award-winning gardens in St Helier. Bedrooms at Westhill Country Hotel are comfortable and pleasantly furnished. There are a limited number of Family Rooms which share a bathroom and Superior Rooms which are large with double bed & private facilities. The West View Hotel is situated in the quiet country parish of St Mary within a short distance of lovely coastal walks of Jersey's north coast. West View Hotel has a range of bedrooms including Superior rooms, all en-suite with TV, telephone, radio, tea & coffee making facilities and hairdryer. At West View Hotel in Jersey there is also a restaurant, heated outdoor swimming pool, lovely granite lounge bar, small games area and car parking. Situated on the Jersey's north coast with superb views overlooking Bouley Bay, The Water's Edge Hotel is surrounded by an area of natural beauty and tranquillity. There are 51 bedrooms, all en-suite, from family rooms to Junior suites and a Penthouse suite, all with a sea or south facing garden view. There are also 6 self-catering accommodation units and swimming pool. Uplands Hotel used to be a former Jersey Dairy farm and parts of the hotel date back to the seventeenth century. St Helier town centre is a 20 minute walk away (down a steep hill). Bus stop nearby. Near the Green Lane network where you can walk and cycle. Free parking. 43 modern en-suite bedrooms with bath or shower room. Attractive outdoor heated swimming pool, gardens and sun lounge. The Atlantic Hotel is a small luxury hotel in St Brelade on west coast Jersey. Breathtaking views over St Ouen's Bay & the Atlantic Ocean. Set within 6 acres of private grounds. 4-star accommodation in sophisticated surroundings. Adjoins La Moye championship golf course. Luxurious rooms/ suites, some have a balcony. Indoor & outdoor swimming pools, spa pool, saunas, mini gym & tennis court. The Talana Hotel is a family run hotel in the suburbs of St Helier in Jersey, and began as a guest house in 1950. The Talana Hotel has a warm and friendly atmosphere and is well located near to Jersey's sights. The town centre is just a 15 minutes walk and 10 minutes from the beach, golf course, squash and tennis courts. At the Talana Hotel there is an outdoor swimming pool. Stafford Hotel is situated in the heart of Jersey's capital, St Helier, and within easy walking distance of Jersey's main shopping centre, business district, local nightlife, restaurants and St Aubin's Bay and Elizabeth Castle. Bedrooms are attractive and comfortably furnished and en-suite. St Brelade's Bay Hotel in Jersey is a unique 4 star Jersey hotel. Surrounded by 7 acres of award winning gardens and facing St Brelade's Bay, it is the ideal Jersey hotel. The family-run hotel offers 82 bedrooms and suites in a variety of types, from stunning Penthouse Suites to newly decorated Sea and Garden View rooms. The Somerville Hotel is one of the finest country house hotels in Jersey with spectacular views overlooking the yachting harbour and village of St Aubin. With an excellent reputation, the 4 star Somerville Hotel mixes traditional Jersey charm with luxury hotel comforts. 59 bedrooms, both Classic and Superior, are comfortable and well furnished and most have sea views. The 'Tides Restaurant' serves a superb menu.